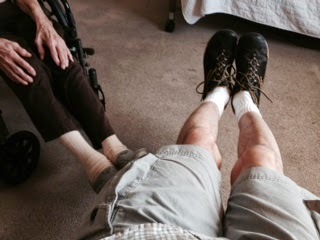 Mom and I doing some leg lifts last summer. little over a week. We don't know how long she has, but as D. once so aptly said about my father in the weeks before he passed away, she's winding down. Ten days ago, as her frail yet strangely resilient and willful body was jostled onto a stretcher (with great care but jostled nonetheless) for the trip from the hospital back to her assisted-living facility—where we would initiate hospice and 24-hour aides—I thought: You'll never have to go anywhere again. This was good news for her, but it made me sad. These are the words that came out of my mouth to D. yesterday: "She was my first friend, my first love, and my first ally." The person I am today is more due to her than anyone else in the world. Always keep the memory of . . . The way you hold your knife.